Better breakfast means better diet results! 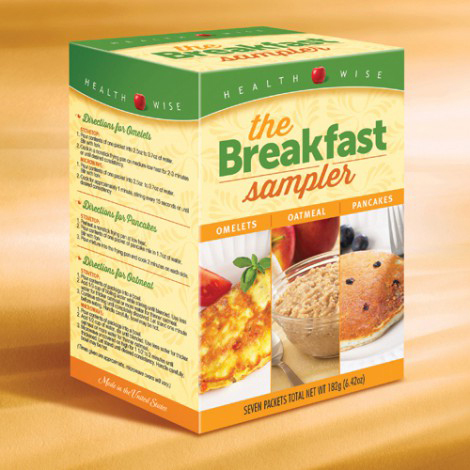 This Breakfast Sampler provides you with 7 different healthy breakfast options to start your day off right and to get your metabolism going. You can’t go wrong with the hot and fluffy protein pancake mix- only 100 calories per serving, 8 grams of carbs and sugar free! Each hot and delicious sampler option is packed with 15 grams of protein per serving! Please view the individual oatmeal product pages for nutritional information, ingredients and allergens. Whey Protein Concentrate, Enriched Flour (Bleached Wheat Flour, Malted Barley Flour, Niacin, Iron, Thiamine Mononitrate, Riboflavin, Folic Acid), Milk Protein Isolate, Egg Whites, Potato Starch, Leavening (Baking Soda, Corn Starch, Sodium Bicarbonate, Calcium Phosphate, Sodium Aluminum Sulfate), Guar Gum, Fructose, Eggs, Salt, Natural and Artificial Flavor, Citric Acid, Sucralose, Soy Lecithin. Whey Protein Concentrate, Milk Protein Isolate, Enriched Flour (Bleached Wheat Flour, Malted Barley Flour, Niacin, Iron, Thiamine Mononitrate, Riboflavin, Folic Acid), Egg Whites, Blueberries, Potato Starch, Leavening (Baking Soda, Corn Starch, Sodium Bicarbonate, Calcium Phosphate, Sodium Aluminum Sulfate), Guar Gum, Eggs, Salt, Fructose, Natural and Artificial Flavor, Citric Acid, Sucralose, Soy Lecithin. Whey Protein Concentrate, Milk Protein Isolate, Enriched Flour (Bleached Wheat Flour, Malted Barley Flour, Niacin, Iron, Thiamine Mononitrate, Riboflavin, Folic Acid), Egg Whites, Chocolate Chips (Sugar, Partially Hydrogenated Vegetable Oil [Palm Kernel, Coconut, Palm], Cocoa [may be processed with Alkali], Dextrose, Whey [milk], Soy Lecithin [an emulsifier], and vanillin [an artificial flavoring]), Potato Starch, Leavening (Baking Soda, Corn Starch, Sodium Bicarbonate, Calcium Phosphate, Sodium Aluminum Sulfate), Guar Gum, Eggs, Salt, Fructose, Natural and Artificial Flavor, Citric Acid, Sucralose, Soy Lecithin. Contains milk, wheat (gluten), soy and egg. All products listed have been manufactured on equipment that has processed milk, wheat (gluten), soy, egg, peanuts and tree nuts. Whey Protein Concentrate, Eggs, Egg Whites, Textured Vegetable Protein (Soy Flour, Caramel Color, and FD&C Red #40), Natural and Artificial Flavors, Salt. Contains less than 2% of the following: Yeast Extract, Partially Hydrogenated Soybean Oil (with BHT as an antioxidant), Beta- Carotene Color (with Maltodextrin, Gum Acacia, Medium Chain Triglycerides, Sucrose, Sodium Ascorbate, Di-alpha-tocopherol), Tomato Powder, Onion Powder, Garlic Powder, Spices, Sunflower Oil (antidusting agent), Vitamins and Minerals (Ascorbic Acid, Ferric Orthophosphate, Niacinamide, Cyanocobalamin, Pyridoxine Hydrochloride, Thiamine Mononitrate, Riboflavin), Soy Lecithin. Contains Milk, Egg and Soy. All products listed have been manufactured on equipment that has processed milk, wheat (gluten), soy, egg, peanuts and tree nuts. I like that you can purchase the variety pack so that you can try each item without committing to the entire box. I really enjoyed the omelet and pancake the best. I’ve just started the pack but I’ve had the Apple & Cinnamon Oatmeal and Bacon & Cheese Omelet. The oatmeal was good but I loved the omelet. Great flavor and consistency.